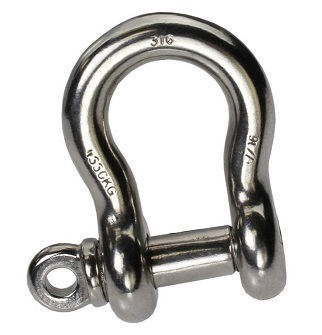 PRODUCT: #SSP038 3/8" CAST STAINLESS STEEL SCREW-PIN ANCHOR SHACKLE, 7/16" Pin Diameter X 2-1/2", 1000 lb. capacity. Price/10. See Safe Lifting Chart on inside front cover. All rated capacities consider a straight vertical lift. Use CAUTION w hen lifting. Any angle beyond vertical (zero degree) will reduce the rated capacity.